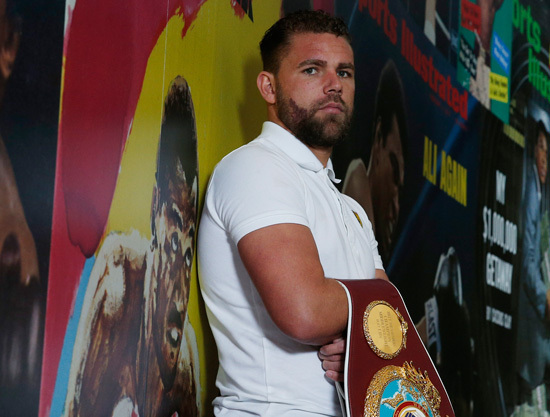 Billy Joe Saunders is a young man with many friends in boxing. Nick Blackwell may have been a ring opponent once but he remains one of Billy’s best mates which is why the WBO world middleweight champion was among the first to contact Nick’s family to check his progress after Blackwell was hospitalised following last weekend’s fight with Chris Eubank jnr. Bill has kept everyone informed by Twitter and fortunately the news gets better by the day. The enduring camaraderie among fighting men who may have blitzed bits off each other is one of the the most heartwarming aspects of the sport; although in fairness I have to say that Bill’s close friendships with other fighters does not extend to Eubank jnr. Never has and probably never will. No doubt this – and his liking for Blackwell – is why he allowed his heart to rule his head when live on screen from ringside he assessed last week’s British title fight. Bill thought Nick would win quite emphatically and he had to hold his hands up afterwards and admit he got it wrong. Even accomplices Paul Dempsey and Richie Woodhall seemed taken aback by his refreshing forthrightness as a Channel 5 pundit. It is a rarity in some elements of TV broadcasting these days. But with Bill what you see is always what you get. Just like the way he fights. I thought he brought a welcome touch of honesty to the TV table. Again, as in the ring, he pulled no punches. It was good to hear views expressed strongly. Bill has always made it clear that Eubank Jnr would never beat him in a month of Sundays. That’s his firmly-held view, and mine too. Young Eubank has a good engine and a varied attack but Bill has the greater gumption, chin and the better boxing brain. Of course a return between the pair would be a seller, and I hope this can happen later this year though I fear attempting to do business with Chris’ dad will be even more of a nightmare now that his lad has a British belt around his waist. But we’ll see. As Bill says himself, he’d much prefer a world unification title belt this summer with Golovkin and that’s what we are working towards at the moment. But first he has to do the business against ‘Mad Max’ Bursak in his first defence at the Copper Box on April 30. Bill promises the fans he’ll sparkle that night so we can look forward to a humdinger of a performance. BoxNation cameras will be there to capture the action which, who knows, may even speak louder than the words Bill no, doubt will be entertaining us with before – and after.